Good morning from Augusta. It’s customary for congressional delegates to invite guests to State of the Union addresses — tonight will be President Donald Trump’s second. “Since the administration wants to stifle expert voices like Joel’s, we stand ready to give them a pulpit,” Pingree said of her guest. Under Democratic House Speaker Nancy Pelosi, expect Pingree to be more brazen in her call for climate change action, like her vow to support firebrand freshman New York Rep. Alexandria Ocasio-Cortez’s “Green New Deal,” which would make the country carbon neutral by 2030. Last year, Pingree invited Christian Castaneda of Portland, who is one of 800,000 people caught in the middle of a debate about the Deferred Action Against Childhood Arrivals program. At the time, Pingree and minority House Democrats were sparring with Trump and majority Republicans over the fate of people like Castaneda. Freshman U.S. Rep. Jared Golden, the Democrat who ousted Republican Bruce Poliquin in November, campaigned on representing working-class voters and supporting labor unions in Maine’s rural 2nd District, which has some of the state’s lowest unemployment rates and backed Trump in 2016. His guest will be Cynthia Phinney, who’s been president of Maine’s largest labor federation, AFL-CIO, since 2015. It represents more than 150 local unions with 40,000 members. Maine’s senators’ choices largely reflect where they are in the six-year election cycle. U.S. Sen. Susan Collins, R-Maine, who’s quietly gearing up for what could be her toughest re-election campaign in 2020, has invited Maine House Minority Leader Kathleen Dillingham, R-Oxford. During the next year and a half, Collins will need to take hard aim at all brands of Maine Republicans, including those moderates and independents who’ve supported her in the past, but especially those who backed former Gov. Paul LePage, who often criticized her while in office. Dillingham represents this choice. Collins’ pick is perhaps also a not-so-subtle flex at House Speaker Sara Gideon, D-Freeport, Dillingham’s chief voice of opposition and, so far, Collins’ biggest 2020 rival. 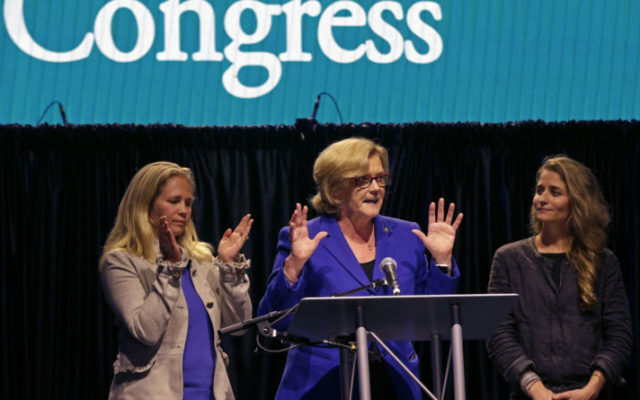 U.S. Sen. Angus King, I-Maine, who in November 2018 won re-election to his second and likely final term, invited Margo Walsh, founder and owner of MaineWorks and co-founder of the Maine Recovery Fund. The organizations work in concert to find jobs for economically vulnerable Mainers, including those recovering from substance abuse disorder. It’s a largely apolitical pick highlighting King’s focus on collaboration among government and local entities to address the nation’s opioid addiction epidemic. — A lawmaker is rolling out a bill that would reverse a state crackdown on using a hemp compound as a food additive. Last week, the administration of Gov. Janet Mills began telling stores to remove certain products containing CBD, the non-psychoactive compound derived from hemp that has skyrocketed in popularity as a purported way to treat diverse ailments from epilepsy to inflammation (scientific evidence is only really there for epilepsy so far). That call from state health inspectors went only to stores that don’t sell medical marijuana and were selling CBD in an edible form — including foods, tinctures and capsules — because the compound isn’t a federally approved food additive. Stores can continue to sell CBD in smokable, inhalable and topical forms. The new bill from Rep. Craig Hickman, D-Winthrop, who co-chairs the Legislature’s agriculture committee, would clarify that the state doesn’t prohibit or restrict of hemp derivatives. Mary-Erin Casale, a Gideon spokeswoman, said the Legislature could send the bill to a committee today. — Five of the Democratic governor’s six remaining commissioner nominees are up for confirmation votes today in the Maine Senate.None of their nominations are in danger in the Democratic-led upper chamber, where the most interesting thing to watch will be how many Republicans oppose former Portland police Chief Michael Sauschuck, Mills’ pick for public safety commissioner. He was blistered at a long Friday confirmation hearing that almost solely became about his past support for gun control policies. All five Republicans on a legislative committee opposed his nomination, which was Mills’ only one so far not to get unanimous committee approval. It’s possible that Senate Republicans have been given no real incentive to support Sauschuck in today’s confirmation vote. — The previous governor’s deal with a private contractor to run a new mental health facility in Bangor severely limits the new governor’s ability to change course. A lease the LePage administration signed last May with the development company that’s building the secure facility on the campus of Dorothea Dix Psychiatric Center in Bangor obligates the state to $11.3 million in lease payments over 30 years for a building the LePage administration estimated would cost between $2 million and $3 million. The agreement specifically bars the state from terminating the lease so it can open a similar facility elsewhere, such as in Augusta — a provision that a former Maine Supreme Judicial Court justice and court-appointed watchdog over Maine’s mental health services called unusual in state leases. Click here to refresh your memory about the five-year process that got Maine to this point. — The utility that wants to build a 145-mile transmission line to carry electricity from Quebec dams to Massachusetts is open to sweetening the deal for affected Mainers. Maine Public reports that as state regulators move closer to deciding whether the project is in the state’s best interests, CMP is negotiating with key players. Those include large energy consumers (such as paper mills), environmentalists and the state’s public advocate, who reportedly wants at least $50 million from developers of the $1 billion project to reduce energy costs for low-income Maine consumers. Some environmental groups and representatives of communities through which the line would travel have aggressively opposed the development. — Bath Iron Works won another big contract to service Navy vessels. Three days after Navy Secretary Richard Spencer toured the shipyard with Maine’s entire congressional delegation, the Navy announced that it had awarded BIW a $126 million contract to continue providing planning yard services for the Arleigh Burke class of destroyers. The contract, for one year with four option years, could potentially be worth $719 million if all of those options are accepted. — The federal government shutdown stalled efforts to get Acadia National Park ready for the summer tourist influx. Park administrators are way behind schedule in hiring more than 100 seasonal employees — a process that typically takes 90 days — who are key to making sure all the park’s facilities are open by mid-April. “We are very concerned about our seasonal hirings,” Kevin Schneider, Acadia’s superintendent, told the park’s advisory commission on Monday. He said he has authorized supervisors to work overtime on weekends to try to make headway in lining up employees for the coming tourist season, which usually kicks into gear in late May. I am blessed with a genetic makeup that allows me to overcome my propensity for unhealthy living. Other than occasionally growing internal crystals in places they don’t belong and burning out minor complementary organs, I have rarely had to challenge medical science to keep myself functioning. To date, annual blood tests indicate that my puffy body functions just within the norms that allow me to avoid the need for medication or other artificial modification. The one recurring red flag in each year’s blood panel is a concerningly low level of Vitamin D.
Despite trying natural remedies suggested by BDN writer Aislinn Sarnackiand ingesting little black pills filled with megadoses of the nutrient prescribed by my doctor, I still fall short of levels deemed to be healthy. The best natural source of Vitamin D is the sun. Because our office in Augusta is basically an underground windowless cell and my job essentially involves staring at a computer for 12 hours, the sun exists largely as a foreign concept to me. On the rare occasions when I do go outside, I’m either wrapped in thick layers of clothing to prevent myself from freezing or in thin layers of cotton and sunscreen to prevent my paler than pale Irish skin from frying like bacon. So days like Monday — not too hot, not too cold, bright sunshine — provide me with a rare opportunity to do something good for myself that I actually enjoy and can tolerate: Walk in the sun.